We went to New York City for Thanksgiving. My husband’s sister lives on the Upper West Side of Manhattan with her husband and their twin son and daughter. We took the Bolt Bus from Baltimore to New York early on Thanksgiving morning. We knew we were going to wind up in some traffic thanks to arriving in the city during the Macy’s Thanksgiving Day Parade and we were not wrong. It took us 30 minutes to go the four block from getting out of the tunnel to our drop off location. Between the parade traffic once we got into the city and an accident on the New Jersey turnpike that slowed down traffic it took us about an hour longer to get there than normal. The drop off location happened to be right near the end of the parade route where all the bands were going once they were done marching. 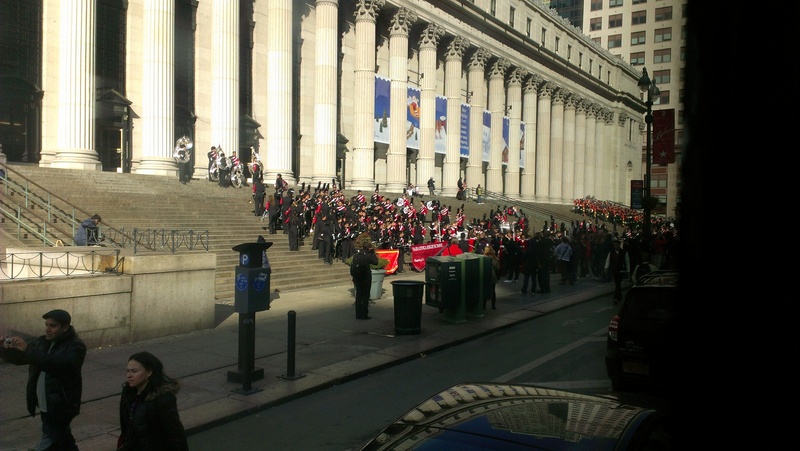 They seemed to be going up and getting their pictures taken on the steps of the post office, which we got a good view of from the bus. Getting off the bus was a little like stepping into my own personal nightmare though. I don’t like crowds at all and we got let off on to a street that was barricaded and between that, people trying to watch the parade, and the bands coming out of the parade there was nowhere to go and just tons of people shoving everyone around. No fun. We finally got out of there and were then trying to figure out how to actually catch a subway since we couldn’t get to where we normally would go because it was on the other side of the parade route. We finally got up to the Port Authority where we were able to cross underground. We did get to see a few balloons passing by the next block over while we walked up, so that was nice. Once we finally made it to the apartment we got to spend the day hanging out with the family including my brother-in-law’s mother and brother. The food was excellent as was the company. 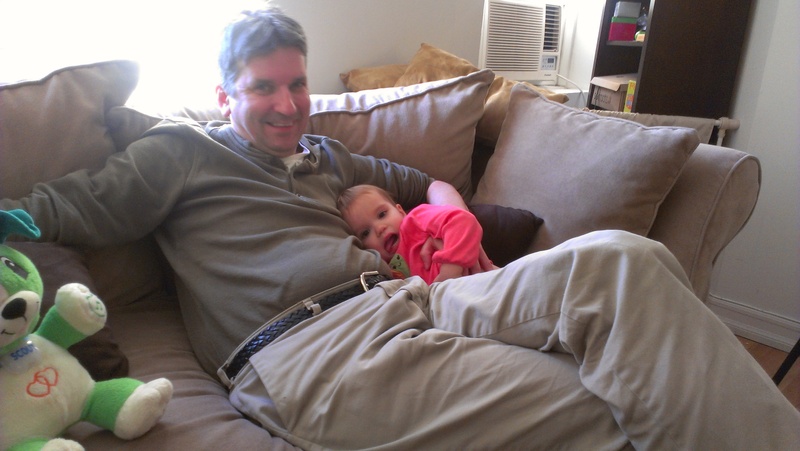 Lily looks like she’s cuddling up with her Uncle Paul, but really she was trying to squirm away. 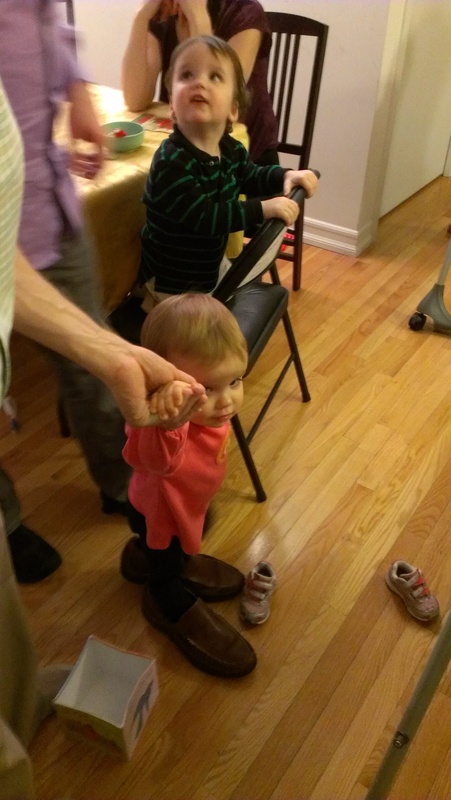 Ryan climbing on the chairs like he does best while Lily stomps around in her daddy’s shoes. 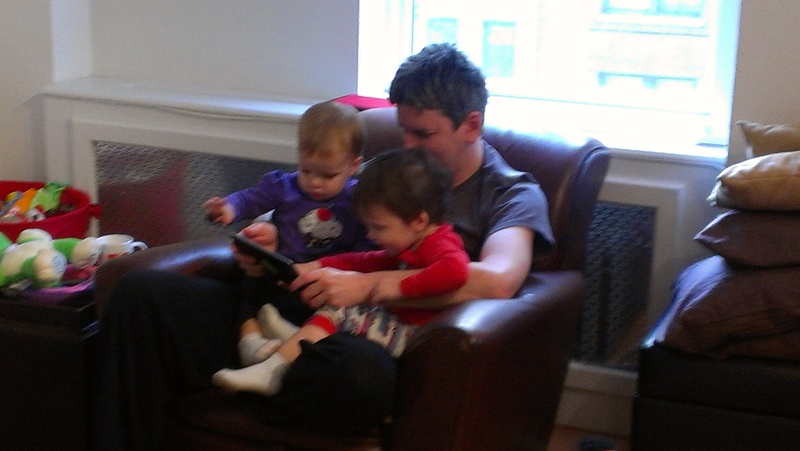 Uncle Paul enticing Ryan and Lily with his Nexus 7 tablet. They were very into that and all the iPads that were in the apartment over the weekend. On Saturday we went to the Museum of Natural History, which for some reason I didn’t get any pictures of. The ocean exhibit was dark so the signs were backlit making them look like screens. It was quite amusing to watch Ryan continually walk around touching them trying to get them to work like the tablets he had been playing with at home. Friday we went to Central Park. 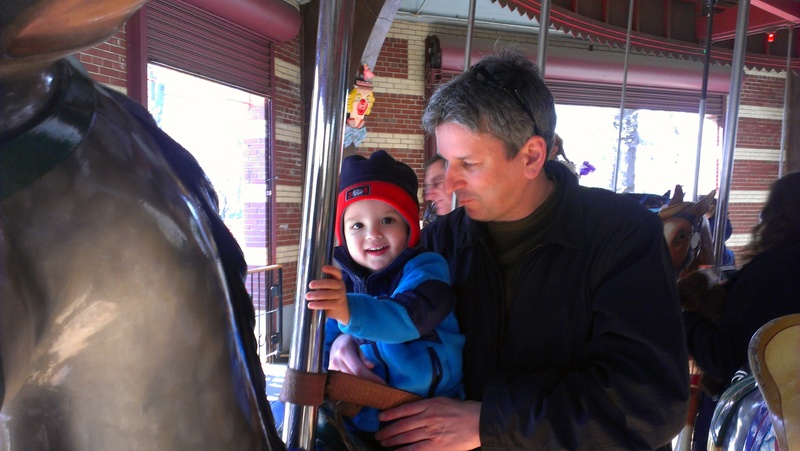 We went to the carousel. 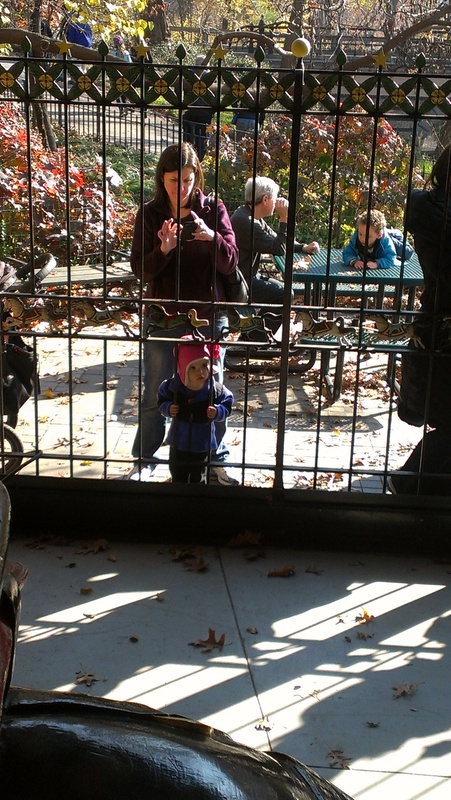 Lily wanted nothing to do with it though, so she watched from the outside while Ryan went on a ride with his and Uncle Paul and me. 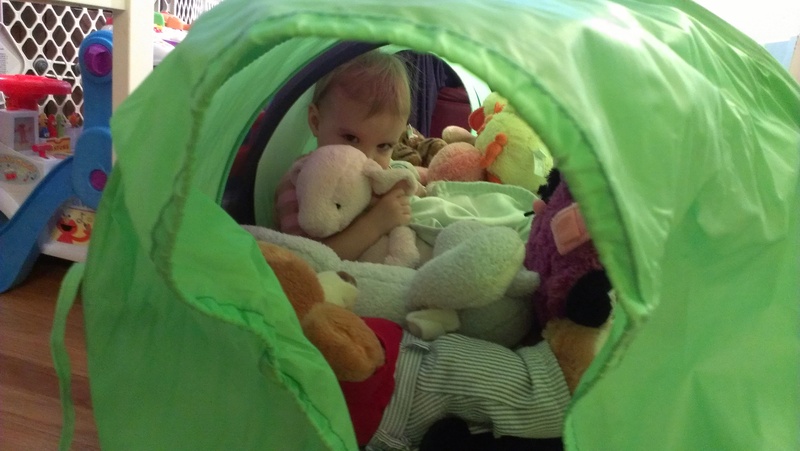 One of the toys they have at home is a tunnel made out of hoops and nylon. Lily decided to put all their stuffed animals inside then climb in herself. It was a fun weekend, and it was great to see the twins again and see how big they are getting. They are talking so much more than the last time we saw them over the summer. I’m sure they’ll seem even more grown up the next time we get to see them.